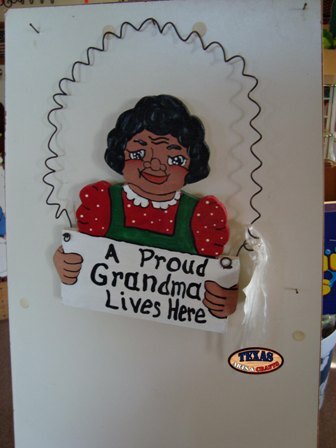 We make the hanging Proud Grandma Sign in our workshop. The middle aged woman is hand painted with a red shirt. The sign reads A Proud Grandma Lives Here. The dimensions for the sign are approximately 9.25 inches tall by 8 inches wide by .75 inches deep. The sign weighs approximately 1.50 pounds with packaging. For the continental U.S. shipping and handling is included in the listed price. For shipping outside the continental U.S. please contact us through our Contact Us page. 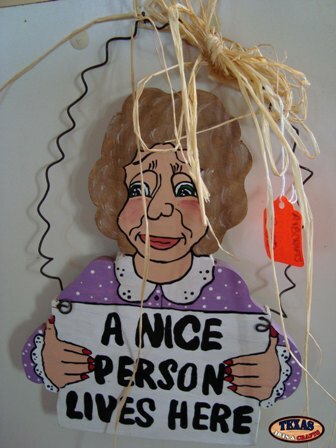 We make the hanging Nice Person Sign in our workshop. The middle aged woman is hand painted with a purple shirt. The sign reads A Nice Person Lives Here. The dimensions for the sign are approximately 10.25 inches tall by 8.25 inches wide by .75 inches deep. The sign weighs approximately 1.75 pounds with packaging. For the continental U.S. shipping and handling is included in the listed price. For shipping outside the continental U.S. please contact us through our Contact Us page. We make the Grandparent Heart Sign in our workshop. A child with several balloons are hand painted within a heart shaped sign. 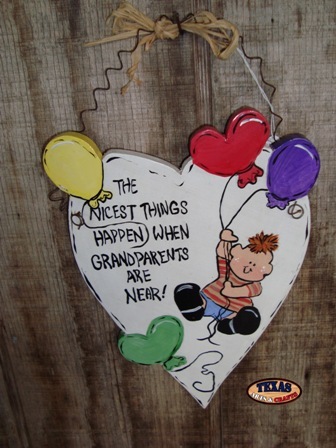 The sign reads The Nicest Things Happen When Grandparents Are Near. The dimensions for the sign are approximately 10.50 inches tall by 8 inches wide by .50 inches deep. The sign is 13 inches tall with the wire hanger. The sign weighs approximately 1.50 pounds with packaging. For the continental U.S. shipping and handling is included in the listed price. For shipping outside the continental U.S. please contact us through our Contact Us page.